Nearly every other detail of the terrorist attacks - from the reasons the towers fell to the actual number of planes hijacked to the blame for the events - on that day has been incredibly fertile ground for the production of alternating theories about what actually happened. On this ground, a loosely-knit group with the semi-official title of "truthers" has been born, and their theories - or conspiracies, depending on your bent - range from the barely plausible to the laughable. Thanks in no small part to the then-burgeoning Internet, their ideas began to spread within minutes of the attacks, and have gained a permanent hold in the lore of 9/11, much like the assassination of JFK can't be spoken about without conjuring up thoughts of the Grassy Knoll. It is impossible to quantify the number of people who subscribe to truther theories, but at least one poll taken five years after the attacks revealed that as many as one out of three Americans believed the U.S. government was either behind the attacks, or knew about them in advance and purposefully did nothing. That the truthers have gained sounding boards with popular athletes, celebrities, and at least one former governor, is a testament to their durability. The widely-accepted (and here greatly summarized) account of what led up to and happened on 9/11 is as follows: Al Qaeda, led by Osama bin Laden, helped recruit, inspire, train, and bankroll 19 hijackers to take over four U.S. domestic flights and crash them into high-value targets in New York City and Washington, D.C., as part of their ever-expanding holy war. They managed to just barely slip past all intelligence and security services largely because of poor inter-agency communication. Two hijacked planes hit the Twin Towers, one hit the Pentagon, and the fourth - which crashed in a field in rural Pennsylvania after passengers attacked their hijackers - was possibly intended for the U.S. Capitol building. The Twin Towers came down because jet fuel ignited incredibly hot fires inside that weakened their supports enough for their eventual collapse. Nearly 3,000 people died in New York and D.C.
To the truthers, that account is utter nonsense. While there is no one theory uniting them, it can generally be said they believe the U.S. government and/or the Jews and/or anyone other than unhinged terrorists orchestrated the events of 9/11 in order to further their own dark and secretive agenda. No matter how much evidence is presented here and elsewhere, it's unlikely to dissuade most, if any, truthers, the psychological reasons for which will be explored in a bit. In the meantime, let's take a look at five of the more popular truther theories, along with some brief rebuttals. Osama bin Laden publicly gloated about and repeatedly referred to al Qaeda's "success" on September 11, 2001. In an audiotape released on May 23, 2006, bin Laden stated, "I was responsible for entrusting the 19 brothers ... with those raids..."
Of course, that is not enough proof for many. The most popular alternating theory in America is that 9/11 happened - either on purpose or by passive allowance - because the Bush administration was itching to go to war in the Middle East. Any official government denial would, of course, not be enough for truthers, so perhaps the words of one of the world's biggest skeptics would help. Noam Chomsky, the infamous "libertarian socialist" who had no fond feelings for George W. Bush nor America's global ambitions, thought truther theories to be utter nonsense, and not just because the science of their theories doesn't add up. "(The Bush administration) would have had to have been insane to try anything like that," Chomsky said. "If they had, it almost certainly would have leaked." The blame-the-Jews theory is very popular in the Middle East. In a 2008 poll conducted in Egypt, as many as 43 percent of Egyptians thought Israel was somehow behind the 9/11 attacks. Among the most persistent post-9/11 rumors was that 4,000 Jews did not show up for work that September morning at the World Trade Center because Mossad, Israel's spy agency, warned them against it. Although an exact tally doesn't exist, the consensus is that anywhere from 10 to 15 percent of the victims of the 9/11 attacks - up to 450 people - were Jewish religiously or had Judaism as their primary cultural affiliation. The U.S. Census has generally put the percentage of Americans who are Jewish at a maximum of 2 percent in recent years. It would be nonsensical of the Jews to leave hundreds behind as martyrs to cover their trail. Even if they had, it's not as if Israel has been made any "safer" by 9/11. This theory generally gets explained via a question: How could an airplane possibly bring down a building as large as the World Trade Center without explosives? Perhaps it's best to let engineers answer this one. Popular Mechanics magazine writes: "Jet fuel burns at 800° to 1500°F, not hot enough to melt steel (2750°F). 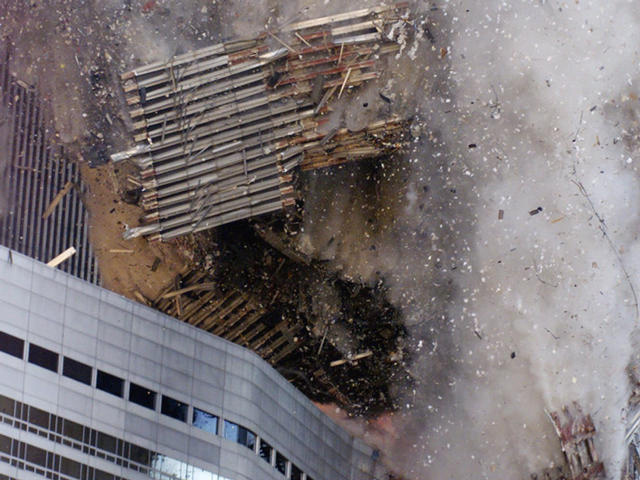 However, experts agree that for the towers to collapse, their steel frames didn't need to melt, they just had to lose some of their structural strength--and that required exposure to much less heat. But jet fuel wasn't the only thing burning, notes Forman Williams, a professor of engineering at the University of California, San Diego, and one of seven structural engineers and fire experts that PM consulted. He says that while the jet fuel was the catalyst for the WTC fires, the resulting inferno was intensified by the combustible material inside the buildings, including rugs, curtains, furniture and paper... pockets of fire hit 1832°F." There are two main reasons this theory exists: One, the high security levels required at and near the Pentagon limited outside reporting from the disaster site; Two, all the public really saw were some small-ish holes in the building itself. Never mind the fact that hundreds of thousands of people live near the Pentagon and therefore at least a few of them would have seen an airborne missile, or the jet that fired it, this is another one best explained by an engineer. Popular Mechanics magazine writes: "Why wasn't the hole as wide as a 757's 124-ft.-10-in. wingspan? A crashing jet doesn't punch a cartoon-like outline of itself into a reinforced concrete building, says (Pentagon inspection) team member Mete Sozen, a professor of structural engineering at Purdue University. In this case, one wing hit the ground; the other was sheared off by the force of the impact with the Pentagon's load-bearing columns, explains Sozen, who specializes in the behavior of concrete buildings. What was left of the plane flowed into the structure in a state closer to a liquid than a solid mass." This is among the most shameful and disrespectful of truther theories, because of the numerous family members who talked to their loved ones on board shortly before passengers stormed the cockpit and the plane went down. To further debunk this theory, audiotapes revealed that the military didn't even know the plane had been hijacked until several minutes after the plane crashed. The theories listed above and the brief attempts at debunking them are just small samples of the incredibly large amount of work that's been put into the fertile ground on which truthers play. The very fact that there are so many theories and people who believe in them raises another question: Amid so much evidence to the contrary, and so much visible heartbreak from victims' family members probably made worse by wallowing in conspiracy theories, why believe in them? The most immediate and obvious answer is greed. Books and DVD movies by 9/11 truthers have sold millions of copies worldwide. There are deeper reasons for their existence though. Tragedy is most often the result of a randomly cruel world. That, however, doesn't let people who were victimized by or who are afraid of tragedy blame someone or something. In an article for Psychology Today, Ilan Shrira wrote: "Conspiracy theories help us cope with distressing events and make sense out of them. Conspiracies assure us that bad things don't just happen randomly. Conspiracies tell us that someone out there is accountable, however unwittingly or secretly or incomprehensibly, so it's possible to stop these people and punish them and in due course let everyone else re-establish control over their own lives. Conspiracies also remind us that we shouldn't blame ourselves for our predicaments; it's not our fault, it's them! In these ways, believing in conspiracies serves many of the same self-protective functions as scapegoating." By grasping at straws, and laying the blame on anything other than senseless, random violence - the very hallmark of al Qaeda's crusade - truthers are trying to make order where there is none, and in the end, the only people they want to make feel better are themselves.